In this article, we’ll explore some ways to optimise the display on your PC. We will discuss screen resolution and font sizes and how they affect your PC’s display and how you work. CRT monitors are still sought after by videogame enthusiasts in particular. Did you know that the larger, old fashioned CRT monitors have several major advantages over the more modern, slim LCD displays that most of us use now? CRT monitors work by scanning a beam rapidly across a fluorescent screen to draw the picture. Unlike LCD’s, this means that there is no true “native resolution”, since the picture isn’t created from small coloured pixels inside the display. CRT monitors also have excellent response times and good colour reproduction, making them good for gaming, if you have the space! Modern monitors have a ‘native resolution’. While most LCD monitors can display a wide variety of screen resolutions, the native resolution will always look best, since this is the screen resolution that matches the number of pixels inside the display. Any other screen resolution may look blocky or distorted, since the number of pixels used in the picture will not match the actual number in the display. You can adjust your computers display resolution easily. For best results with your monitor, you should use the latest display drivers and monitor drivers and run your monitor in its native resolution. For more information on updating your display drivers, see this link. If you find that text or window elements are too hard to read at higher resolutions, you should first try increasing text size before resorting to changing to a smaller screen resolution. Changing screen resolution is easy. Simply follow the tutorials below for a guide on how to change resolutions on each of the three versions of Windows. Remember that if you change the screen resolution to a mode that your monitor cannot display, all you will see is a black screen. Usually all you need to do in this situation is wait for Windows to switch back to the previous resolution. Check the instruction manual that came with your monitor for details of which resolutions it can display. If you are unable to select the correct native resolution, you may simply need a driver update. Don’t overlook ergonomics when positioning your monitor. Monitors should be placed at around eye level and if possible positioned so they are not opposite a window. You should also check your monitors instructions for details of how to adjust the display picture. This 15 pin connector has been a standard way of connecting monitors for over two decades. It is an analogue only standard that is capable of transporting very high resolution pictures. The Digital Visual Interface (DVI) replaces the VGA connector in modern computers. It is capable of carrying both digital and analogue signals and will result in a crystal clear picture when used with a compatible monitor. HDMI connectors carry only digital signals and are designed for use with consumer electrics and home theatre systems rather than PC’s. If your PC’s video card has both HDMI and DVI connectors, you should normally use the DVI connector to connect to your monitor. You can use the HDMI connector to connect to a HDTV set for gaming or watching movies however. 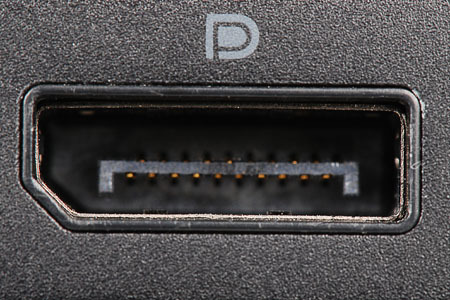 Often confused with HDMI connectors, DisplayPort connectors are found on some newer graphics cards and monitors. Capable of carrying sound and also very high resolution video, DisplayPort is gaining more traction in the professional market. It is possible to buy converters to change between DVI, HDMI and DisplayPort. These converters are usually quite affordable since all three standards are similar. Converting VGA to DVI or HDMI is also possible, but more complex as it involves converting an analogue signal to a digital one. When physical space is at a premium, such as on smaller laptops or tablets, manufacturers often use mini or micro versions of the HDMI, DVI and Displayport connectors. To connect these, you may need a specific cable or adapter. Consult the documentation that came with your device for more information. The refresh rate refers to how often a monitors picture is refreshed, or redrawn. Typically, a higher refresh rate results in a more stable image and reduced eye strain. Refresh rate can sometimes be adjusted under the advanced display settings in Windows. It is normally not necessary to change this value as Windows will select the optimal value for you. Although most users simply choose the colour settings they like best, there are ‘correct’ values that can be chosen that are closest to the standard for film and television. Web sites such as this one offer additional test patterns for correctly setting up a display. DVD or Blu-Ray Software such as the HD Video essentials can be purchased for those who are looking for a way of perfectly calibrating their displays. Informative and interesting, allowing for all but, the pedantic techno enthusiast, to glaze over or complain that their Asthenopia has caught up with them and buzz-off somewhere else. So, is there an on-line interactive self-assessing screen optimiser out there?